For all the chatter over the state of music discovery lately (Jim, preach! ), some things never change: your favorite bands have favorite bands. I looked up ‘80s underdogs Felt entirely on the recommendation of The Clientele, hoping to find an antecedent to the London band’s spectral folk-rock. In Forever Breathes The Lonely Word, I got something else – a missing link between New Wave and the birth of the twee movement. 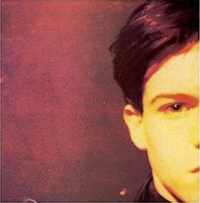 The 1986 album, the Birmingham band’s sixth in as many years, was released just a year before the launch of Sarah Records and within months of The Smith’s The Queen Is Dead, both touchstones in Felt’s sound. Like their colleagues in The Smiths and, to a lesser extent, The Church, Felt’s music is founded on layered guitar melodies of varying bombast backed by glimmering chords, a template later further simplified and embraced by a generation or two of indie-pop acts. While the synth tones should ring a bell for Belle & Sebastian fans, singer Lawrence Hayward’s voice is another story, a dorky, romantic warble that’s equal parts Buddy Holly and Lou Reed. Song for song, the album’s remarkably consistent — and remarkably great. How do records like this one become lost in the mists of time so easily? Friends: get Lonely.